With its vast forests, fish-filled coastal waters and remote tundra, Alaska sustains a large population of birds of prey. Some species live in the arctic and subarctic regions throughout the year, while others migrate north for the summer breeding season. You can find eagles, falcons, hawks and owls throughout the state if you know where and when to look. 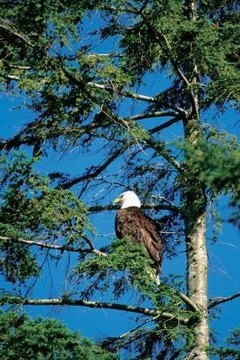 Found throughout Alaska, bald eagles prefer homes near lakes, rivers and seas where they can find plenty of fish. Their wingspan can reach 6 to 8 feet, and they weigh between 6 and 14 pounds. Golden eagles are slightly larger, weighing up to 15 pounds. Aggressive predators, they kill deer, foxes, juvenile caribou and Dall’s sheep, as well as smaller prey such as snowshoe hares. Alaskan golden eagles travel south for the winter. The great gray owl, North America’s largest, resides in the state. These birds can hear prey, such as small rodents, more than 300 feet away. Great horned owls, who sport feather tufts resembling horns, live throughout subarctic Alaska. Found along the state’s southern coast, the northern saw-whet owl prefers coniferous forests but also might settle in woods near bogs, rivers and swamps. Snowy owls spend their summers above the Arctic Circle, where they hunt rodents on the tundra. Western screech owls, who actually hoot and trill, live along the coast in southeastern Alaska, typically in forests that border streams, rivers and lakes. The northern goshawk lives in subarctic Alaska’s forests, where its prey includes crows, grouse, snowshoe hares and squirrels. Sharp-shinned hawks, who live in thick forests along the southeastern coast, prey primarily on songbirds. Several other hawk species summer in Alaska. Red-tailed hawks prefer open spaces such as fields, surveying the terrain from atop a fence post, telephone pole or tree. Rough-legged hawks prefer taiga and tundra environments. Northern harriers prefer open areas such as tundras, marshes and prairies. Ospreys live near lakes, oceans, rivers or wetlands -- anywhere that contains fish, which they catch by diving. Swainson’s hawks migrate to Argentina during the winter. Gyrfalcons live along Alaska’s northern coasts. The world’s largest falcons, they feed on ptarmigans and other birds. Peregrine falcons summer throughout Alaska, with some populations spending all year along the southeastern coast and islands. Preferring to nest in cliffs and other high spots, they prey on other fowl, including ducks, shorebirds and pigeons. American kestrels summer in inland Alaska. Preying on insects and small animals, they prefer open spaces, such as grasslands and meadows. Merlins occupy the southeastern coast and islands of Alaska, where they prey on shore- and songbirds.